Book of The Month November selections are here! Is it too early to say Happy Holidays? Book of The Month has a sweet holiday offer. Buy a Book of the Month gift and get a free book for yourself. 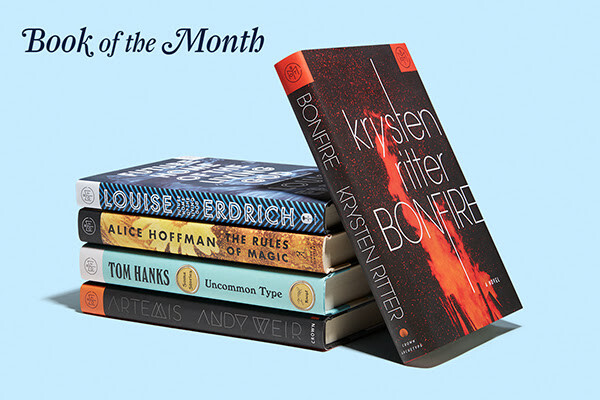 In fact, one of BOTM selections is Bonfire by Krysten Ritter (Marvel’s Jessica Jones star and a previous BOTM guest judge! )––a suspenseful story about a badass woman who must confront her past. BOTM is also featuring Future Home of the Living God, a dystopian story selected by Guest Judge Tavi Gevinson (Editor-in-Chief of Rookie mag); Artemis, a new sci-fi heist from the author of The Martian; The Rules of Magic, a witchy tale selected by Guest Judge Mae Whitman (of Parenthood fame); and, last but not least, Uncommon Type, the debut short story collection from Oscar-winner Tom Hanks. BOTM also has two extras: The Martian, the bestseller by the author of our November selection Artemis and And Then There Were None by Agatha Christie. Don’t forget about their FREEBIE deal––this month, anyone who uses this code can get Bonfire, Artemis, or The Rules of Magic free when they join!